Onsite recordings and interviews exploring the educational workshops and process behind the Earth Day youth art exhibition, "Seeds: Time Capsules of Wilderness". Review of "Radio Dreaming" by art writer and novelist Tracey Warr. 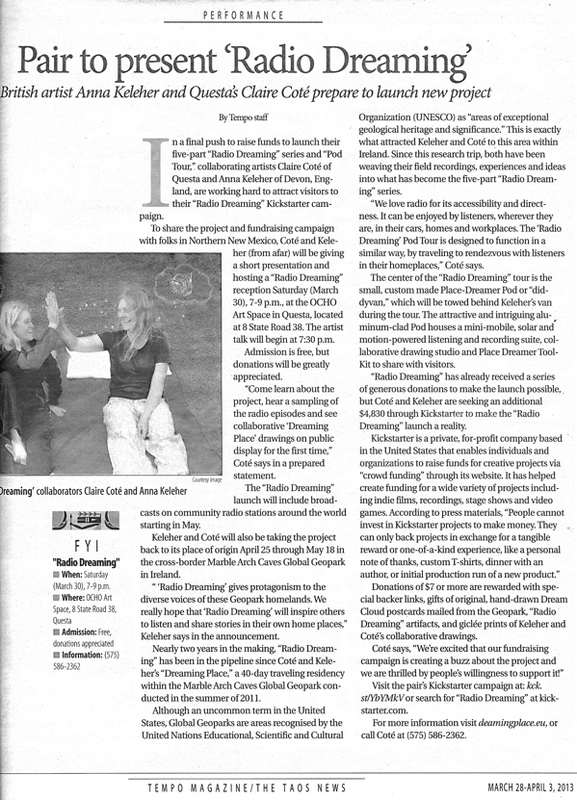 This article was the cover feature of the Taos News (local newspaper for the town of Taos), for the week of October 6th. The article describes the philosophy of 'SEED' and provides specifics about this year's exhibition. In the printed version six large images of SEED 3 artwork were featured. Radio feature about SEED 3 for KRZA Radio 88.7 fm, by news contributor and A Las Ocho producer, Lisa Goldman. "DREAMING PLACE 60wrd/min review by Lori Waxman" DREAMING PLACE was reviewed by 60wrd/min art critic, Lori Waxman as part of “The Exchange”, Cornwall UK. Click here to read review. The focus of this article is the video outcome, "What's in the Water" to be premiered at NeoRio 2011. The video was the result of an educational collaboration between LEAP, Wild Earth Studio and Jennifer Vialpando's Questa Junior High Art Class. The article described NeoRio, hosted by the BLM and organized by LEAP and Wild Earth Studio. This article in the "Taos News" features "How Far From Home Are We? ", an exhibition and multi-sensory installation at the Harwood Art Center in Albuquerque, New Mexico, of the collaborative project by Anna Keleher, Claire Coté and Rebecca Beinart. "Going to Outlandia" by Tracey Warr, August 2010. “Capturing the Motion of Your Gait” referenced in Tracey Warr’s blog her blog post exploring motion and mobility in the arts. One of the examples she uses is our project “Capturing the Motion of Your Gait”. Check out the post here. As part of the LAND/ART project in New Mexico in the fall of 2009, Extreme Media Studies created an online exhibition of works from the many projects and exhibitions. Visit the online exhibition here. This culminating book for the LAND/ART project, features documentation of the large-scale collaborative project that took place in Albuquerque, NM in the fall of 2009 and involved over 25 organizations and over 200 artists, writers and performers (including us!). 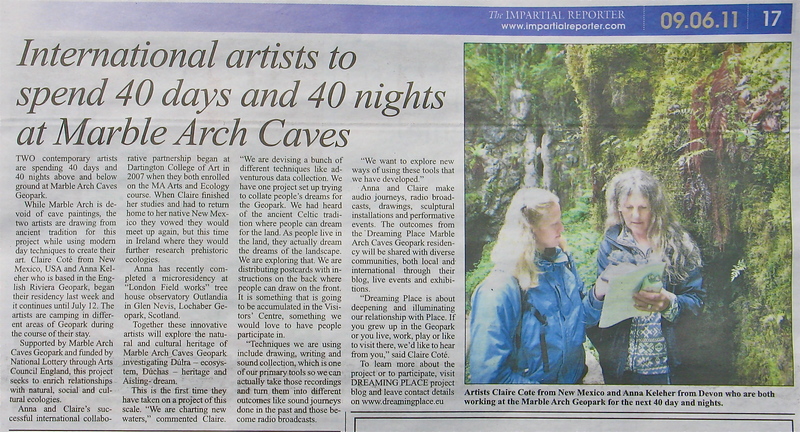 Featured as an article in the arts pages of the monthly magazine. “Approaching an Exchange: Dartmoor” – Radio interview on BBC Radio Devon The project, “Approaching an Exchange: Dartmoor” was featured in an interview with David Squires on “Devon Lives”, BBC Radio Devon, aired August 30 and September 2, 2008. An article announcing Claire Long (Coté's) first solo exhibition in Taos, "Color by Osmosis."